Have you tried cooking with your children? How does it go? No, let me rephrase it, how does it end? Messy and stressful? Same here. We start well, with very good intentions. By the time we finish though, there is flour everywhere, rolling pins are rolling on the flour, fruits and vegetables are ready to sue us for battery and I would be standing there making myself promise to not do this again. Ever. Few meals later, we would attempt to cook together again. I worry about the mess and the cleaning up I have to do after. (They do help me with the cleaning, but the real cleaning is always left for me to do.) I remind myself that it can and will get messy, there will be a lot of cleaning up, but I’am teaching my children a very important skill. From my few years in the kitchen, I’ve come to learn that cooking, contrary to popular belief, is an important life skill. Yes, life skill. It is the most under rated and over looked. And when it comes to Indian boys or men cooking? Let’s not go there. So why am I so resolute about teaching my kids to cook? The answer is simple – the easiest way for my children, or anyone for that matter, to lead a healthy life is to learn to cook and prepare meals at home. I’ve experienced both sides of the coin – eating homemade meals and depending on daily take outs – and I firmly believe that healthy homemade meals are the way to go. I do not know how many recipes I will be able to teach them at the rate we are going – it is a slow and time consuming process when you have more than one child in the kitchen. But so far, they have learnt to make Bournvita or Milo for themselves, to roll rotis or samosa pastry, peal vegetables, use the blender and food processor etc. Talha has also learnt to pour dosa batter and flip rotis on the tawa. Masha Allah. One, they are not glued to cartoons on TV or YouTube. Two, we have conversations and we really get to know each other. Yes, they are my children, but there are many things I still don’t know about them and vice versa. Three, they learn the names of different ingredients, in different languages – English and Malayalam in our case. Talha teaches me the Arabic names he learnt from school. Four, you can tell them where the food comes from and make them more aware of nature and surroundings. Five, their interest in gardening increases when they see me using curry leaves / herbs grown in our balcony. Six, and the most important, they are not picky about eating food they cooked themselves or watched me cooking. So my dear fellow moms, if you are in the same boat as me, do not give up. We will get there, I promise. And for your hard work and perseverance, here’s a sweet treat, just for you. 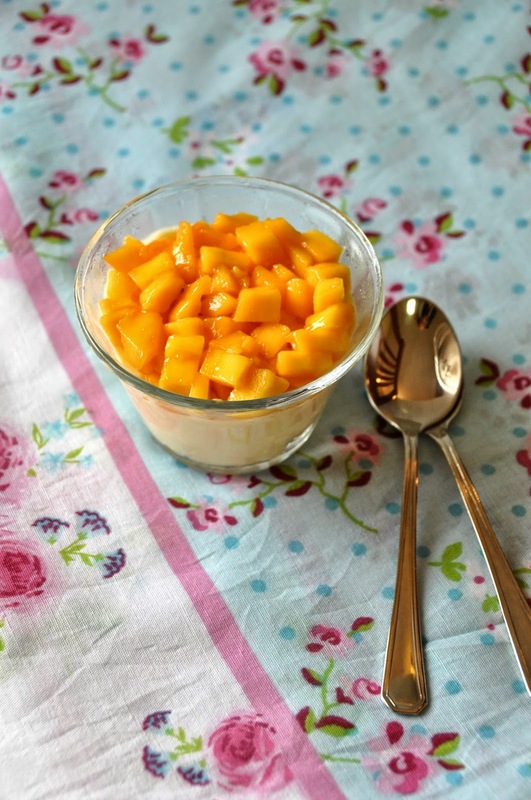 I came up with this recipe last summer but the mango season was almost over by then and I decided to blog about when mangoes were back in season. I recently made it when my school mate paid a visit and also for couple of parties. It is very easy to put together and much loved by everyone. Oh, and you could definitely make this with your children. Blend first four ingredients together. Layer a pudding dish with lady finger biscuits. If you are using individual dessert cups, you could simply break the biscuits into bite size pieces and layer them. 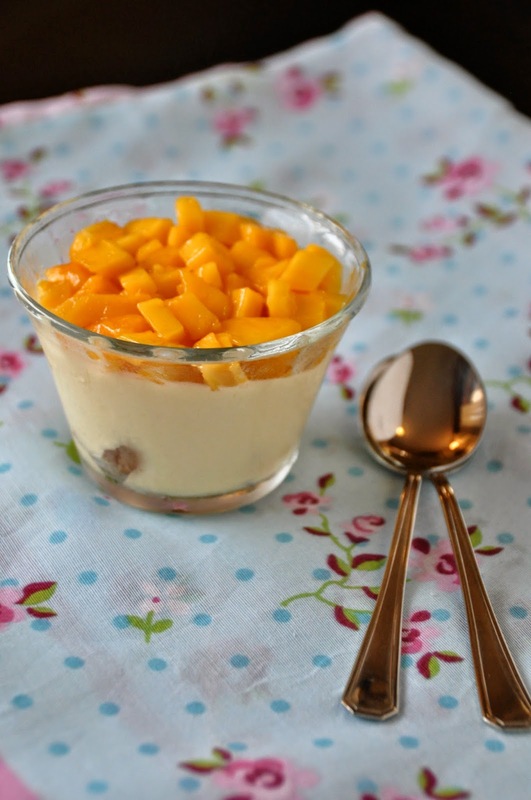 Pour the mango cream on top. Finish the top layer with mango cubes. Chill for six to seven hours. Enjoy! I use Badami mangoes as I find them easier to cube. If your biscuits decide to float in the pudding, do not worry. It is only because the cream isn't thick enough. 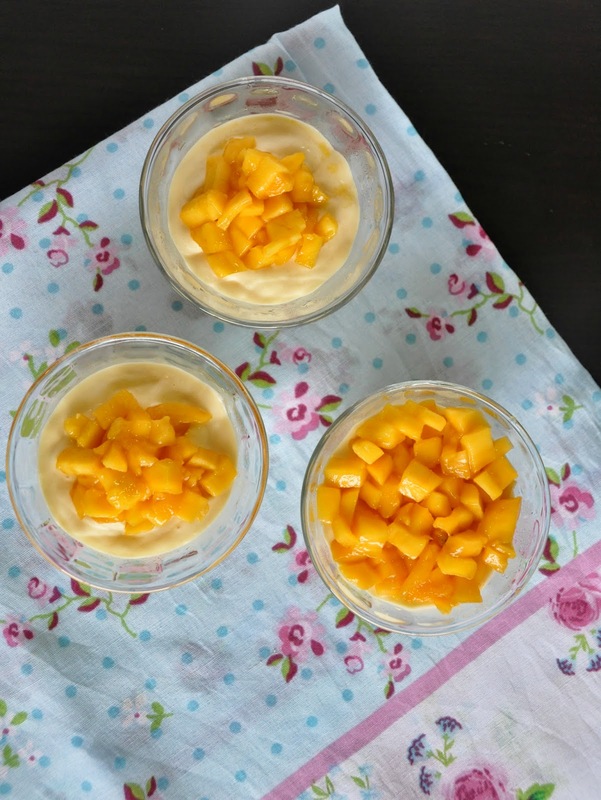 It would still taste delicious and next time you make the pudding, you could adjust the ratio according to the mangoes and cream you are using. Looks great Neelu, very summerish! I do love cooking with Rowan but it does often end in a big mess. I am inspired by this post and will keep on trying. Plus my son has become a very picky eater and I am hoping that by involving him in cooking he will learn to like food more. Oh yes, it is messy to cook with children. I've noticed that my children won't fuss much with the meals I cooked in front of them.